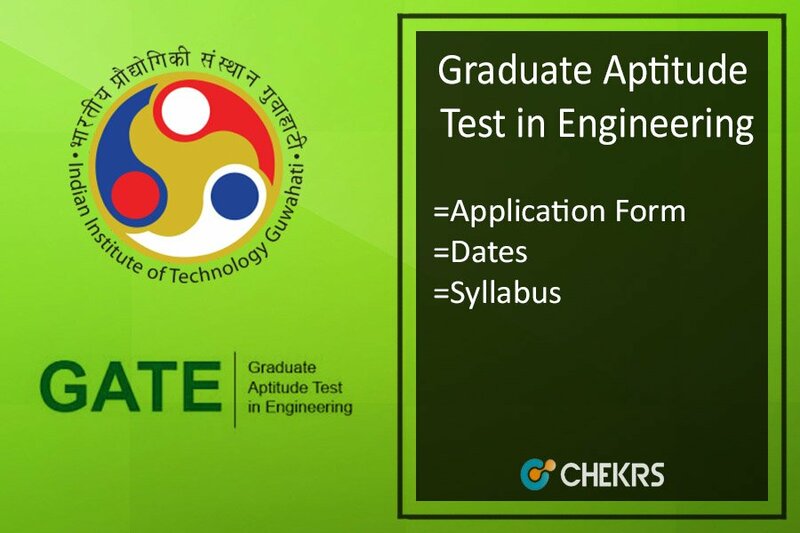 Graduate Aptitude Test in Engineering is an entrance examination which allows admission in various IITs and IISc for pursuing M.Tech Course. The qualifying candidates will also get joining in Various PSUs. The GATE 2019 will be conducted by IIT Guwahati in the month of January 2019. There are total seven IITs and IISc which takes admission in the M.Tech course such as IIT-(Delhi, Bombay, Guwahati, Kanpur, Madras, Roorkee, Kharagpur), and Indian Institute of Science (IISc). We are giving GATE 2019- Notification, Application Form, Eligibility, Important Dates, Syllabus, Previous Year Papers, Notes etc. So refer below table for your searches. The GATE 2019 score card is valid not in M.Tech Admission in IITs or IISc but also accepted by various government/ private institutions which provide Postgraduate engineering course. Nowadays so many government or private companies hire the candidates on the basis of GATE score card. The GATE 2019 examination is conducted through online mode to maintain transparency. The GATE examination level is adjusted from the very basic knowledge to check the candidate’s knowledge in the subjects. Lacks of candidates each year appear in the entrance examination to either pursue masters of technology in the respective department or to get into the PSUs. Students prepare too hard to qualify the entrance examination. For your convenience, we are providing you with each small but important information on this page. You can click on the links mentioned in the table to get updated with the information related to GATE 2019. The GATE is an entrance exam which is conducted for the B.Tech students to get admissions in various IITs and NITs. Soon the authorities are going to announce the GATE 2019 Notification on their website. This year the examination authority for the GATE exam is IIT Guwahati. You can check more details about GATE by checking notification. The students who are going to apply for the GATE 2019 exam, they are required to check the eligibility criteria for that. Only eligible candidates can apply for the exam. The aspirants have to check the norms for the application such as age limit, qualifications etc. You can access the GATE 2019 Eligibility Criteria here. The controller of examinations of GATE i.e. IIT Guwahati will release the official dates in August. The application will be available here after the announcement. The aspirants can download and check all the dates related to the GATE exam like application dates, last date, Admit card, exam date, result date etc. here. The students will be able to access the Application form for GATE 2019 here. The students who are seeking admissions in postgraduate courses in reputed institutes, they can apply for the GATE 2019 Application Form. You can apply for the form in August and we will provide a direct link to which you will be able to access the application form as well as will be able to pay the application fees. The students who are preparing for the entrance exam and have covered all the topics for the exam. They can check the GATE Previous Year Papers. They are advised to solve them on daily basis. This will increase their chances to qualify the GATE 2019 Exam. The students can check all the previous year question paper according to their branch here. The students can use the GATE Sample papers for their practical purpose. The papers are available here. The students should solve them regularly so that they can improve their efficiency to solve the paper. As the GATE is the toughest exam for engineering. Students must have all the sample and model papers for their practice. The Graduate Aptitude Test in Engineering will be conducted in Feb and students have very less time for their preparations. So that they are advised to learn all the topics from the GATE 2019 Syllabus. The syllabus is given here according to the branch. The aspirants can get pdf of the syllabus according to their subject they can also check the GATE Exam pattern for the entrance exam. They can practice according to the weight age of the topics with the help of Syllabus. The students who are going to appear in the GATE 2019 exam, they will require the GATE 2019 Admit Card to appear in the exam. The students can download it here. Without admit card no student will be allowed to enter the examination center. They are also advised to bring their photo identity for proof on the day of the exam. Th admit card will contain all the details regarding the exam like the name of exam, venue, date etc. The Indian Institute of Technology Guwahati will release the answer key for the GATE exam after few days of the exam. The students will be able to download the GATE 2019 Answer Key Set and branch wise. It will help them to check their answers which they have made in the exam. For all the information regarding the answer key, you can click on the link provided here. The students who will participate in the GATE 2019 exam successfully will be able to check the GATE 2019 Cutoff here. The students who will clear the cut-off marks will be listed in the Merit List. The GATE 2019 Cutoff can be check here year wise. The students will be able to get an idea about the present year examination cut off. The IIT Guwahati will announce the results in the month of March. The students can check their results here branch wise. The authorities will announce the results for all the branches on the same day. For further updates regarding the GATE 2019 Results, you can visit us here. The students who will qualify the GATE Exam will be called for the GATE 2019 Counselling. The students will have to choose their preferences in the counseling process. The students will be allotted seats according to their GATE Scorecard. You can check here all the details about the counseling procedure and Schedule for the Admissions.